The SDRM202 is an accessory for TM1800 and TM1700. SDRM202 can be used with EGIL equipped with the SDRM option and CABA Win version R03A or higher, however the single channel SDRM201 is recommended. The SDRM202 is intended to use for both static and dynamic resistance measurements (SRM and DRM) on high voltage circuit breakers or other low resistive devices. Used together with TM1800 and TM1700 the current and also the voltage-drop across the circuit breaker contacts are measured. The measuring unit can thus calculate the resistance as a function of time. An SDRM202 unit includes current cables and an SDRM Cable which comes in three versions, for TM1800 and TM1700 and EGIL respectively. 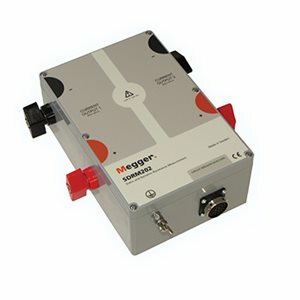 The SDRM Cable is a small box with integrated cables for connection to the SDRM202 and to TM1800, TM1700 or EGIL.